NPL Micronized Creatine Monohydrate provides the purest, most readily absorbed form available. Through many clinical studies, creatine has been shown to be effective in increasing workout performance and anaerobic endurance. 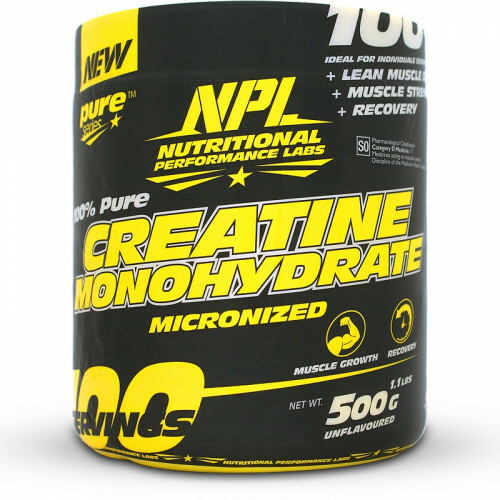 Creatine is stored as phosphocreatine in the muscle tissue. This substance provides energy for muscular contractions. Phosphates produced are needed for regenerating adenosine triphosphate (ATP) molecules, which is the main fuel for the enzyme motors of the muscle in high intensity training. This in turn increases energy levels and optimises recovery rates. Creatine supplementation has also shown to buffer lactic acid build up during training, which means improved recovery for your next power workout. Allergen Warning: This product is manufactured in a facility that uses materials containing Milk, Wheat, Egg, Fish, Peanut, Shellfish and Tree Nuts. • Mix 1 rounded teaspoon (5g) with 150ml-250ml of water or your favourite sports drink 1-3 times per day, preferably on an empty stomach. • On training days consume before and directly after a vigorous workout. • On non-training days consume 2 servings 6-12 hours aport, or as recommended by your fitness advisor. Consult your doctor prior to use. Not intended for use by persons under the age of 18. Do not use if you are pregnant or nursing unless prescribed by a sports physician / dietician. Avoid use if diagnosed with liver damage, kidney failure or Rye's Syndrome. An overdose may result in gastric disturbances. If symptoms persist reduce dosage or discontinue. Maintain an adequate state of hydration during use.